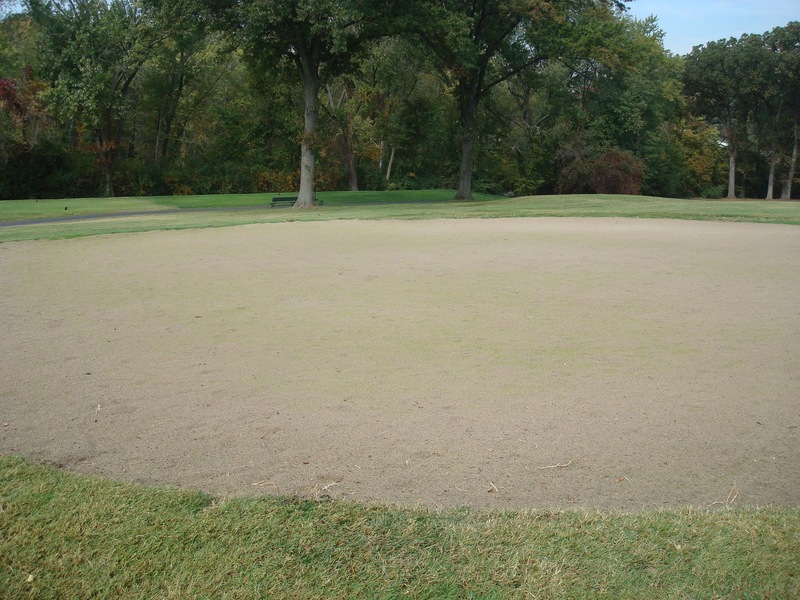 Well, its getting that time of year where we need to have a discussion regarding frost, the delays that can be incurred and why we don't allow golf to be played on frosty turf surfaces. The last thing we want to do is to delay your enjoyment on the golf course but sometimes mother nature requires us to be patient and wait a few minutes because of frost. We have faced a few days of frost over the last several weeks but it has only been present on the rough grass and has melted away before any players were attempting to start their rounds. Frost early in the season might only require a few minutes delay but as the temperatures become increasingly colder, the restrictions could last an hour or two. Any delay will include the practice green as well so no practice putting until the restrictions have been lifted on the putting green. There are occasions where #1 is still frost covered and the PG area has cleared off. The USGA has a great animated explanation of frost delays in the link below. Climate prediction models from the National Weather Service for the U.S.A. from Dec.-Feb are posted below. These models are updated every 15 days which allow for greater confidence in the predictions as it gets closer to winter. They are predicting a potentially warmer than normal and wetter than normal winter. Last evening, multiple individuals broke a pane of glass out of one of our shop windows and took 3 carts out on property. They stole my digital camera that I use for the blog but left everything else in place. The 3 carts were found out on the course in the area of 3 and 4 where they have been entering the property. They did some damage to our #12 green which you can see in the picture below. The damage should be able to be repaired fairly quickly. The green was aerated yesterday which probably helped to reduce some of the damage due to the heavy application of sand. 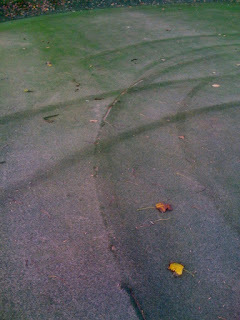 There were some turn marks on the 2nd and 15th greens but they did not break the turf's surface. Hopefully, we can catch this group of vandals and get this damage stopped. The remaining 10 greens were aerated today. 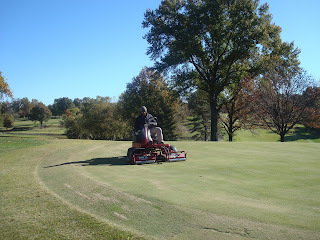 The greens aerated last week were mowed as well this afternoon with the riding greens mower. 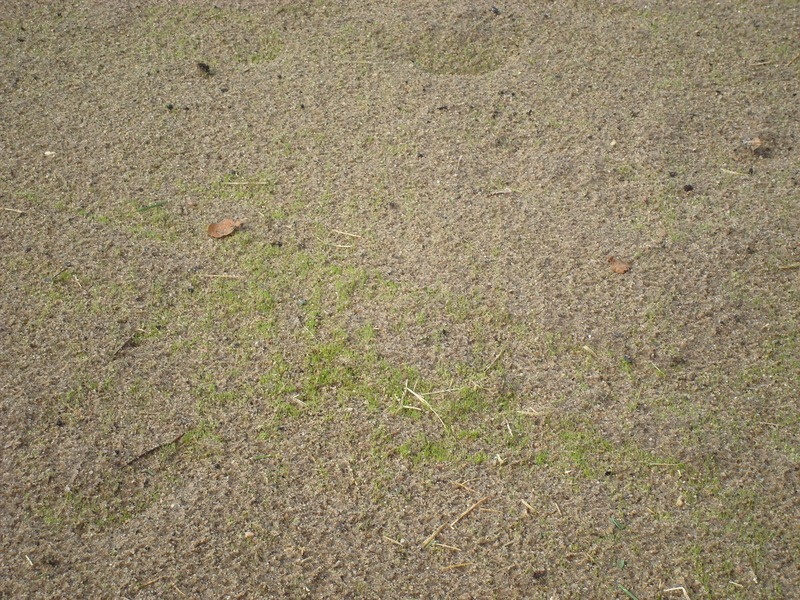 Rains expected over the next day or two will help the sand settle and will allow the turf to grow more than it has over the last couple of very dry weeks. Mother nature's rainfall is much better for growing turf than our irrigation system. I expect our ball roll to continue to improve throughout the week. We should be able to mow first thing in the morning by early next week as the turf grows through the sand. Congratulations to staff member Jason Thomas and his wife Stephanie on the birth of their first child. Camryn Gloria Thomas arrived Tuesday morning, 5 lb. 14 oz. Everyone is doing fine and going home today. We have been able to complete 8 greens over the last couple of days with our fall deep tined aeration program after the outing on Tuesday and before regular play in the mornings. Greens 1-4, 15-16, 18 and the PG have been completed. 17 green will be completed tomorrow morning. We hope to complete the remaining 9 greens by Monday(we will work until dark) or Tuesday morning at the latest. It is always our desire to complete our greens program within a couple of days so that recovery of all greens occurs at the same time but weather and business interests require us to adapt our strategy from time to time. We still have some great growing weather over the next few weeks for our greens to recover but I did not want to delay our program for another week. We've had exceptional conditions to complete the greens this week without interfering with any groups except for a couple of early morning single players. Weather sites have been reporting over the last 7 days that a change in our dry pattern(rain) is going to take place over the weekend and possibly into next week so it was time to start. We began today to dry mow the greens that were aerated on Tuesday(1-4). 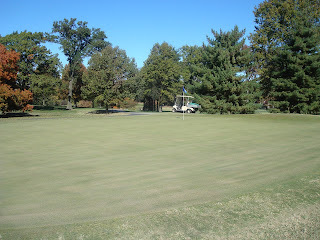 The greens had an additional dragging of the surface and the subsequent mowing of them looked great. The process we utilize in completing our aeration is slow and takes at least two days and sometimes a part of a 3rd day to complete. Our desire is to have equal or better ball roll within a few days of completing our work as what we had before the process started. We appreciate your consideration during this most important process. Russ aerating 18 green with our 7316 Verti-drain. Mechanic Harry did the honors on Tuesday. The rear view of our process. 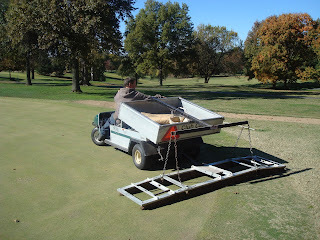 We placed the sand on the green first to reduce the potential tracking from our sand topdressor and utility vehicle. 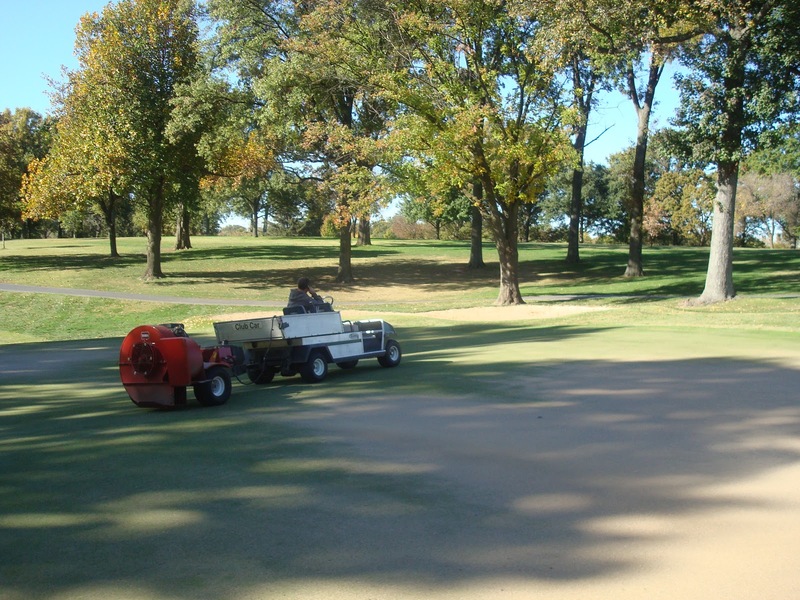 Normally our sand applications are made with a spinning type broad casting mechanism but with a heavy band type application, we used our brush attachment which provided a 1/8' layer of sand on the green. Most greens received about 2.5 tons of sand on average. The spacing of the aeration holes in relation to my cell phone. About 2.5" apart. This is a view of Russ dragging today of one of our finished greens from Tuesday. We normally used our drag brush directly after the aeration was complete and before the sand was blown in the holes. 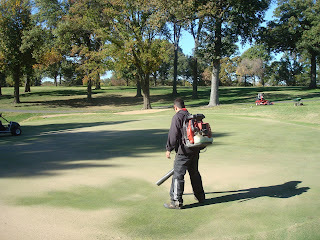 Here Russ is using our leaf blower to blow sand across the green which helps to fill holes full of sand. Tom is also helping to fill holes along the edge where excess sand can build up. Assistant Mike is rolling the green to smooth the surface and place it back into play. Normally, we will mow our greens at the end of the process but our turf is so tight at this time from recent grooming/verti-cutting that there is very little turf that needed to be cut. 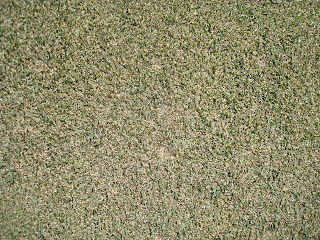 We will brush the greens again on the second day after aeration and will then mow them as they begin to grow. 4 green today after being brushed and mowed. The greens surface with holes filled with sand and the turf being stood up from the brushing activity and heavy sand topdressing. We were only able to get 4 greens aerated yesterday(Greens 1-4). Overall, they turned out well. We have a little extra sand on #4 that needs to be moved around but a majority of the holes were filled with sand. We are planning to do the PG this morning to get it completed so it will be healed with the others. #18 will be done as well since it is at the end of play and we will be able to get it completed before play makes its way around. 15 greens to complete next Monday are just too many in one day with the heavy application of sand and the amount of time it takes to work it into a green. I will take some pictures of the operation this morning and post them in the next day or two. Too busy yesterday to get proper pictures since I was doing the topdressing and helping to get the sand worked into the holes. 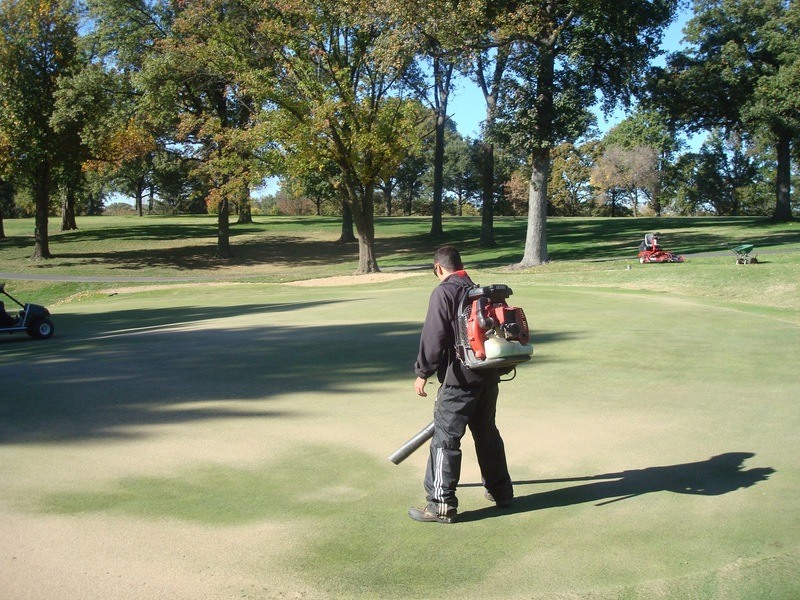 As the health of our greens continue to improve, so does the ball roll. 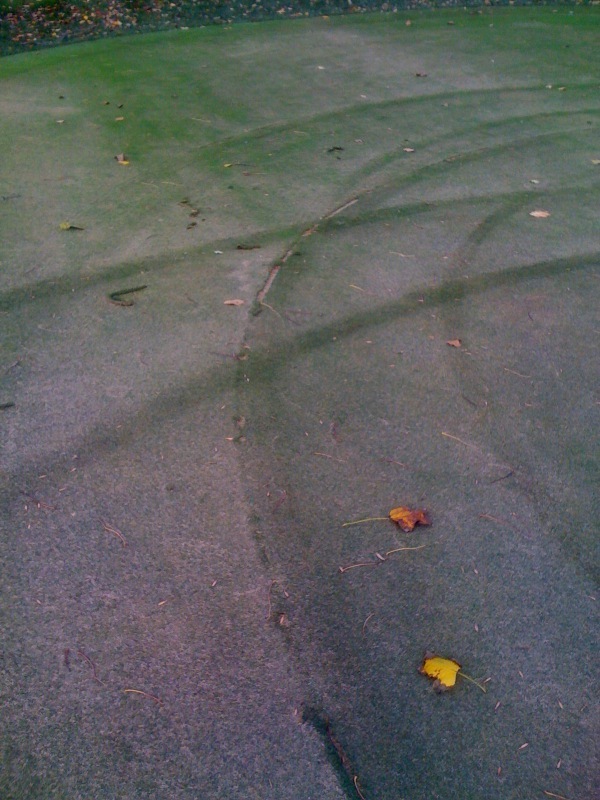 The blemishes from this summer have not completely healed but the ball roll is probably at its fastest of the season. Our green program of topdressing, grooming/verticutting, dragging and mowing over the last few weeks have allowed our heights to come down and have improved considerably the ability of the ball to roll out to the hole since Labor Day. I was able to play during the Men's closing day on Saturday and we had great ball roll that day. Our local superintendents association; Mississippi Valley Golf Course Superintendent's Association had its annual Research and Scholarship Fundraiser yesterday here at the club and the ball roll was faster yet with two more warm days and lower humidity than the weekend. The wonders of dry, warm conditions and a couple of extra days of rolling. 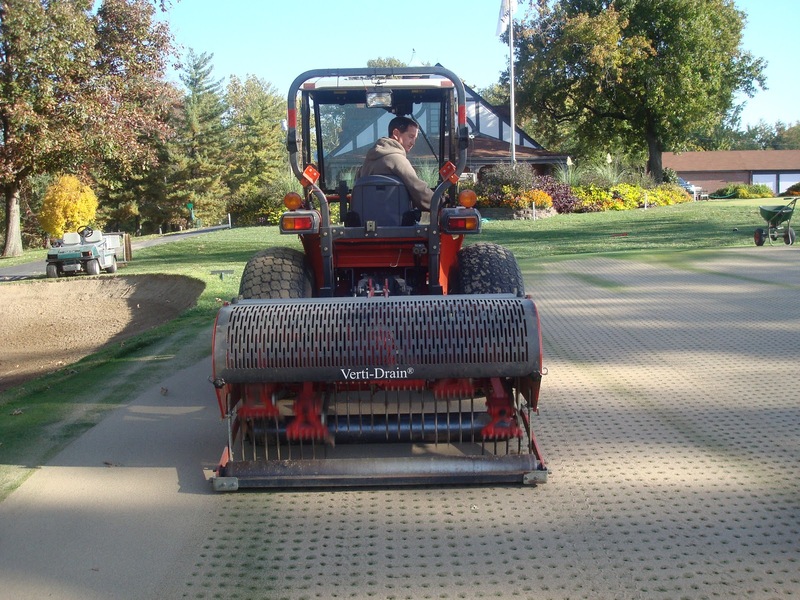 Just a reminder that our fall deep tined aeration will begin next Tuesday after the collegiate event has made the turn on the front 9 and we are able to work without disturbing play. We will aerate to a depth of 8-10" using a 1/2" solid tine. We will use enough sand to fill the holes. I would expect our greens to be back in good condition within 10 days. During the recovery process, mowing will not take place until the dew has left the green surface by around 10-11 a.m. Mowing with moisture on the green surface could lead to a sandy mess on the green which would inhibit ball roll. We will do everything we can each day to remove dew from greens which will allow greens to be more playable for our early players. 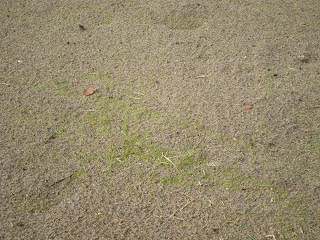 The nursery green was seeded last week and has already germinated as of this morning. The weather has been great for growing in turf as long as you have supplemental irrigation since it has been so dry. I would expect more visible signs of life by this weekend. We will continue to water on a regular basis with possibly more frequent cycles with less water to keep the seedlings from drying out. Fertilization and fungicide applications will be made weekly to keep the growth moving and assist with any plant health issues. Rolling and mowing will begin as soon as the turf has filled in enough to do so. This can usually be done within the first couple of weeks of emergence. Here are a couple pictures of the new seedling emerging. Wide angled view of the new seedlings emerging on the nursery green. A close up of the new seedlings. 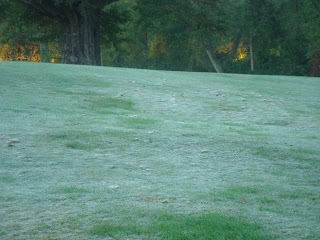 The last couple of days we've experienced some light frost in the rough. The frost was not heavy enough to cause a delay but is a gentle reminder that colder morning temperatures could begin to affect start times in the next few weeks for our early playing members. 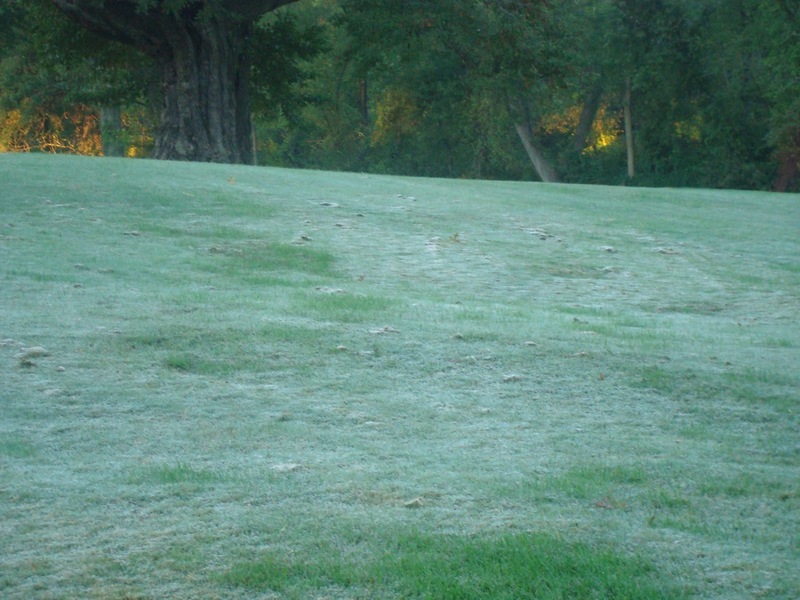 The average frost date in our area usually occurs around October 7-10 so we are not too early with the first frost. The first killing frost(when temperatures go below 32 degrees) for St. Louis is around November 1st. The earliest killing frost on record was September 28, 1942 and the latest occurred last year on November 27th. Since temperatures are going to moderate over the next 7-10 days, I will wait for a couple of weeks to discuss frost delays and why we have them. In the meantime, enjoy the great weather we are going to experience over the next few days. Greens are fast and getting faster with our 3rd week of verticutting, sanding, brushing and mowing. 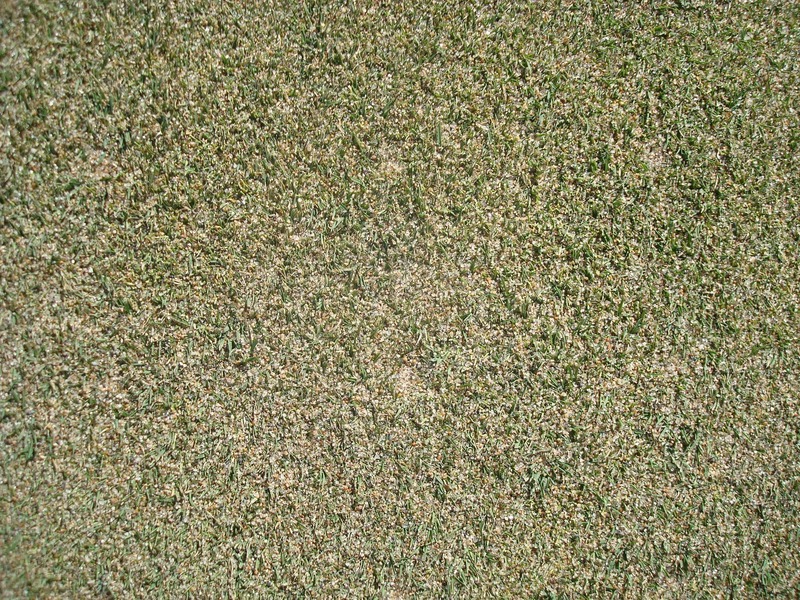 Additional growth regulators have been applied to reduce overall growth and to begin to slow poa annua. Over the next couple of days, we will be leveling the nursery green next to the 18th tee with sand and will be reseeding the green. 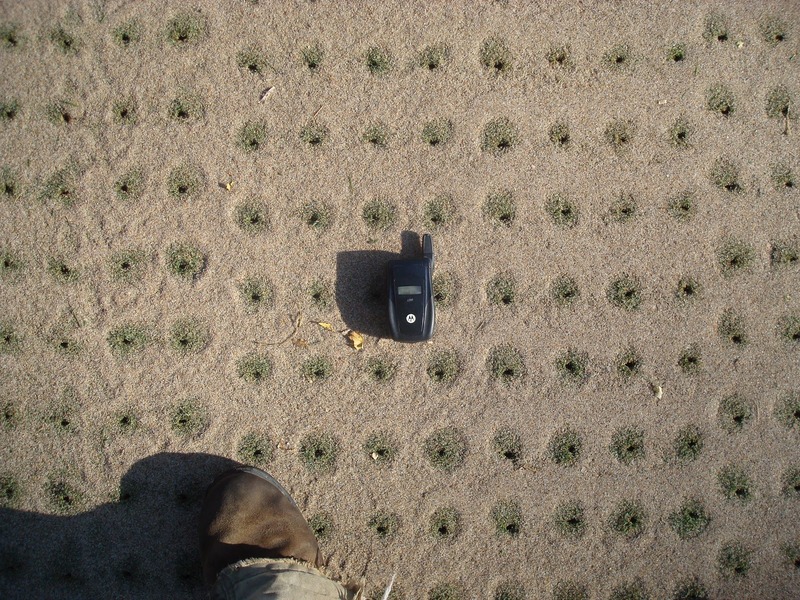 A majority of the turf was used to repair and or replace collar turf with some plugs being used to fill in greens as needed. Assistant Mike and Arian moved a 20 ton load of sand onto the green on Friday. 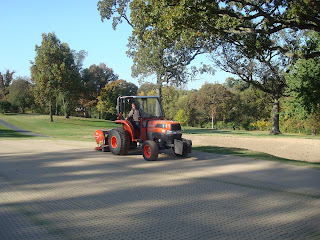 More pictures to follow this week and we prepare the green for seeding. Arian unloading a workman load of sand onto the nursery. As we speed through our daily work on the golf course or the rounds of golf that are played on a daily basis at our club, there are some interesting wonders of nature that we should take notice of as we make our way around the golf course. There are a number of colonies of honey bees that inhabit our property. Normally, we are not able to view their work because it usually occurs in a hollowed tree but a few weeks ago, a colony formed to the left back corner of #5 green and the blue tee on #6 out in the open on a lower limb of a pine tree. Initially, I thought it was a hornet nest forming which we would spray and kill but once I examined the site more closely, it was honey bees. Over a few weeks they worked very hard to supply food for the colony and protect their queen. Last week, I noticed the colony was beginning to disband and were in a frenzy as they were preparing to leave this new site. Bees were flying everywhere, especially in the Barton's yard as they were preparing to move on. Once they finally left the area, I was able to get a couple shots of the honeycomb left behind. Also included in the pictures below are the work of a busy spider in the front lawn spinning a web between a flower bed and the dogwood tree which grows in the center of the bed. I'm not overly thrilled with being too close to spider either but I am amazed at the work they can perform in a short period of time. I've also included a picture of a bluebird resting on the tee sign of #14 tee. You can see multiple families of bluebirds fluttering around between holes 3,12,13 and 14 tee as well as along the main road near the 10th tee. They will be very active feeding over the next few weeks. Honeycomb hanging from the lower left branch of the pine tree. A close up view of the bee colonies work. A spider's delicate work in the front lawn of the club. A closeup view of the work. A bluebird resting on the tee sign of hole #14.